Cobh -The Gateway to Munster. – Paper Never Refused Ink! 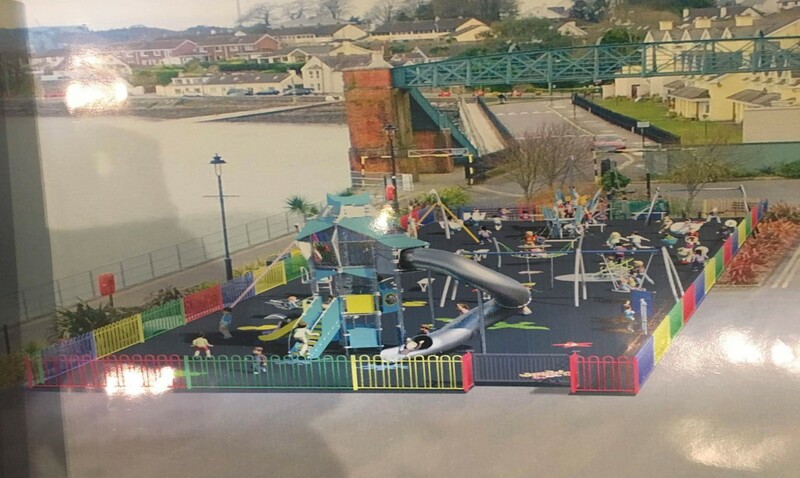 I have the privilege of being the Public Relations Officer for Cobh Playground Fundraising, I have written this article to raise awareness of my beautiful adopted town and to highlight the huge community project which we have been undertaking for over two years to deliver a state of the art all-inclusive playground for all the Children of Cobh. 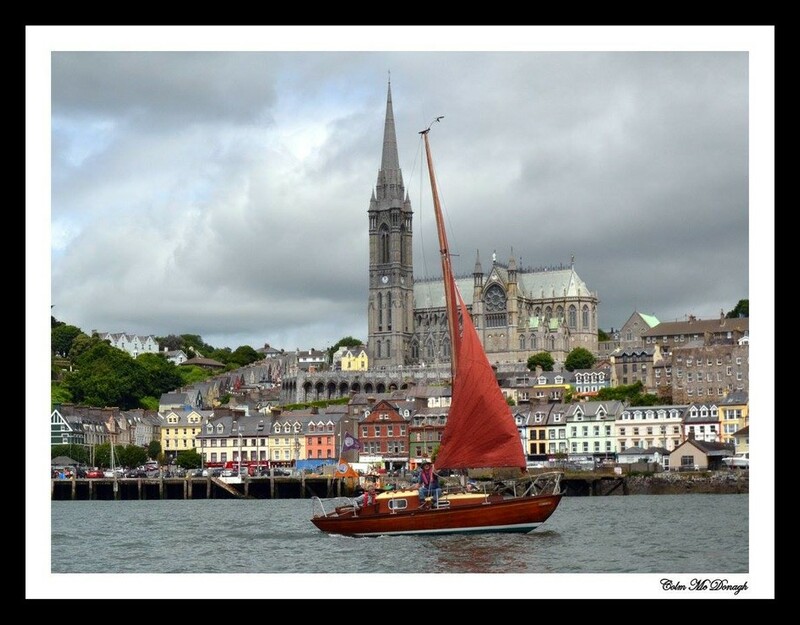 Cobh is the most beautiful seaside town in Ireland, looking out over the vast Cork harbour where the mighty River Lee runs down to meet the ocean. A place of rich history, which has stunning natural beauty and it is where the world’s largest liners come alongside the Deep Water Quay. The huge floating palaces carrying thousands of tourists each year are vast in scale and they tower over the brightly painted fishing boats which set out from the small little piers and coves with their pots & nets seeking to bring home the bounty of the waters outside the harbour. From a vantage point at the foot of the magnificent St. Colman’s Cathedral, where over one’s head the 49 bell carillon rings out the passing of the hours, one can see the fortress island of Spike, Irelands Alcatraz, which is a must visit location for any family on holiday with something for everyone from history buffs to ghost hunters. 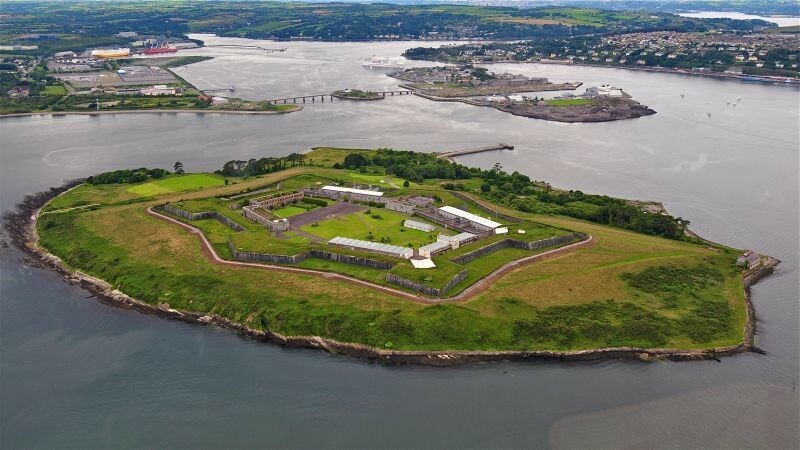 Further to the right Haulbowline Island where the sleek grey ships of Irish Naval Service can be seen. The sight of a state ship returning home from a month-long patrol in the far reaches of the Atlantic, the tri-colour ensign streaming, the ships company fell in facing Cobh, following the ancient tradition of indicating that no guns are manned, is stirring to the imagination. Out further still one’s eye is draw past the industry of the White Gate oil refinery & terminal to the harbour mouth where all maritime traffic must pass beneath the watchful forts of Camden & Carlisle as they were known when all the harbour defences were still in possession of the British Empire. Yet even while surrounded by the history which seems to be soaked into every stone and while borne away by the natural glory of the harbour, the town of Cobh has another treasure, its real beating heart. A more inviting and friendly community one could not hope to find. They are passionate about their town and they are deeply invested in its future. You can see on any given Sunday, the local Tidy Towns group, as busy as ants, as section by section they weed, pluck, paint and plant in an unequalled display of community spirit which keeps the public spaces clean, fresh and vibrant. 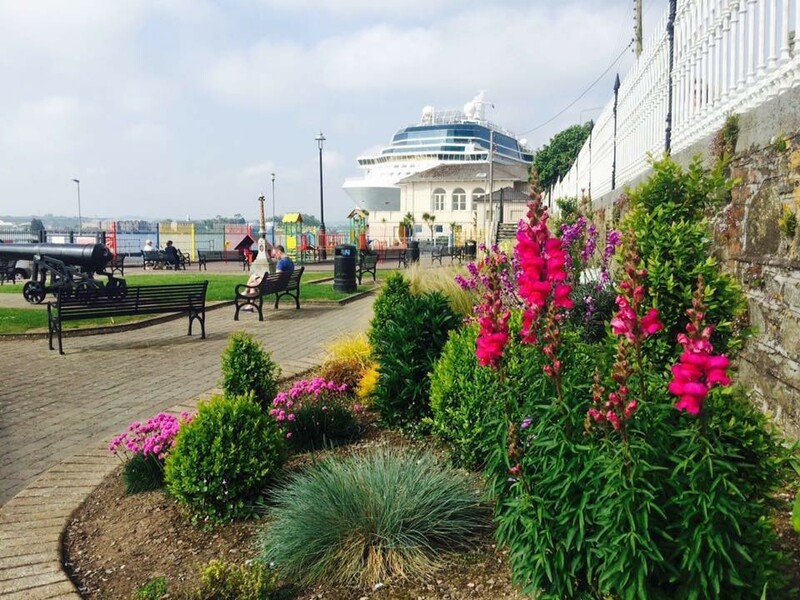 Some of the hard work of Cobh Tidy Towns. You could only be inspired by these good people in the tidy town’s group to try to do some good, in some small way within one’s own town. Cobh Playground Fundraising committee was established in July 2015. The Committee consists of local parents who came together and decided to do something about the inadequate provision of suitable play spaces within the town. It was the brain child of local father and carpenter Gerard Maher who in the tradition of the start of many of the best ideas said, ‘Enough is Enough’. He then gathered about him a loyal crew and set sail for what at the time in the July of 2015, seemed to be distant shores. And it was no easy task which was about to be undertaken, the current playground provision in our town consists of the ‘Five Foot Way’ located adjacent to the Deep-Water Quay, where only three items of play equipment are all that remain from an original five piece set and there is another smaller ‘toddlers’ play are located on the ‘Promenade’ opposite the Commodore Hotel with four pieces of equipment. The ‘Five Foot Way’ shortly after opening, it is worse for wear today. 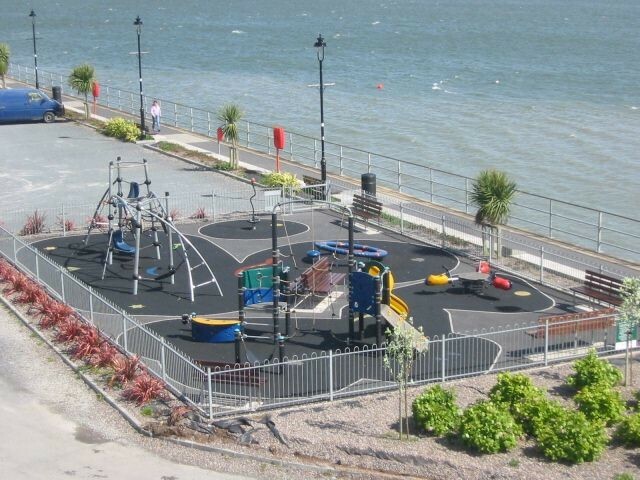 These play areas are deemed suitable for use by up to 30 and 20 children respectively which is well below requirements for the population of Cobh which is 17,396 according to Census 2016. A population of over 2704 children between the ages of 0-12 years and 3599 children under 18 years. Cobh families have been deprived of adequate playground provision for many years, without any provision whatsoever for a child who is differently abled or has a special need. This often means families must travel outside of Cobh in order for their children to have a free Playground experience. It is for these reasons the Playground committee have come together to collaborate on a playground project and turn this idea into reality. All journeys need to start with the first step and all the best projects need to start with a good plan. To secure a suitable site and install a modern, state of the art playground suitable for use by all children in our community. To draw up a plan and design for such a playground. A playground which we are committed to incorporating equipment that will allow and encourage the integration of children with mobility restrictions and sensory issues to join in the fun. To enable all children from an early age to experience an enjoyable atmosphere while learning and socially interacting amongst their peers when using a playground. To provide in our town a safe environment for our children to play and maintain a healthy lifestyle. Our timeframe for completing this project is in late 2017 or spring 2018. That first aim ‘secure and install’ takes money, a whole lot of money. The range of fundraising which has taken place since 2015 until now is huge. Marathons, Quiz Nights, Raffles by the dozens, Parachute Jumps, Family Fun Days and an infamous Full Monty have raised thousands upon thousands of euros, donated from the hard-working people of Cobh (and many from further afield) whose generosity has often left the fundraising committee humbled. The support of the local business has also been phenomenal, we keep a list of the dozens of business sponsors on our webpage. 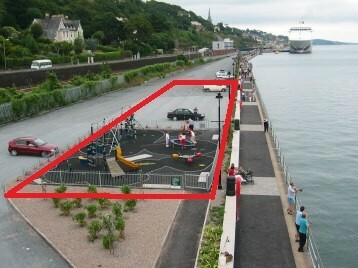 The red outline of what will be Cobh’s new playground. The partnership early on with the fantastic local town manager Mr Paraig Lynch and local town Engineer Mr Robert O’Sullivan have served to set the project on the correct heading from the start. The full & committed support of all the local elected representatives from all parties and none was also a crucial factor. Mrs Sinead Sheppard, Mr Anthony Barrett, Mr Cathal Rasmussen, Mr Kieran McCarthy and others were behind us all the way. Cork County Council is a key partner in this project. With the aid of all the above we secured the permission to expand the ‘Five Foot Way’ play area by nearly 250% from Cork County Council, in this vastly increased area we also now have planning permission granted to construct and install our new Playground. We have also been hugely successful in securing over €67,000 in funding through various Cork County Council funds and grants. We cannot thank the officials of the Cork County Council enough for their tremendously important role in the delivery of this badly needed community resource. We also want to thank Minister for Children and Youth Affairs Katherine Zappone, TD. We have met with various companies and using the knowledge gained of the mindboggling range and scope of play equipment available on the modern market, we sat down and drew up plans & prospective budgets. These plans and budgets have changed slightly as we grew in confidence and we started to succeed in fundraising. 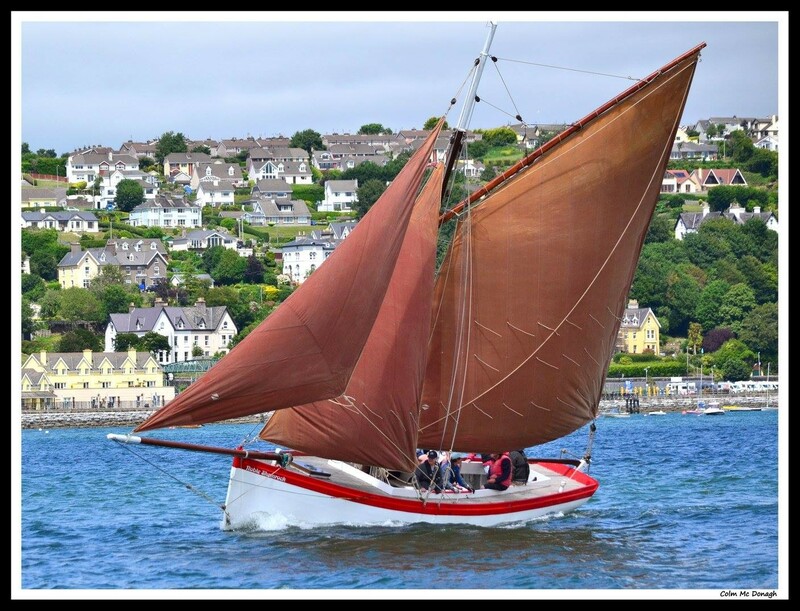 Determined to make this project belong to the people of Cobh, the group has used online surveys and public meetings to ensure that what the people of the town have been consulted at each stage. An artists impression of one possible design in the new space. This transparency and openness have been a key part of the group’s core belief from day one, too often projects have been delivered in small towns without the residents feeling of shared ownership, this has not and will not happen here. When the group proceed to formal tenders in mid-September 2017, the final chosen playground will contain what the town wants and most importantly what the children deserve. An all-inclusive state of the art playground which will cater to the needs of all the towns children, with slides, swings, roundabouts, zip lines, towers, see-saws and many multi-functional units. We go to formal tenders in September and when we settle on the winning tender we will be able to reveal the final plans. A real sense of excitement will we feel start to build once people can see what will become their playground. And the most important achievement is that through the hard work of an entire community and through long hours of fundraising this playground is going to be delivered, the current accumulated fund stands at €163,540 approximately. With many fundraising events to go, the remaining €16,000 is more than achievable. Some of the committee with his Excellency the Lord Mayor. These achievements have been recognised and the group was honoured twice in 2017, each time they accepted the award on behalf of the children & people of Cobh. 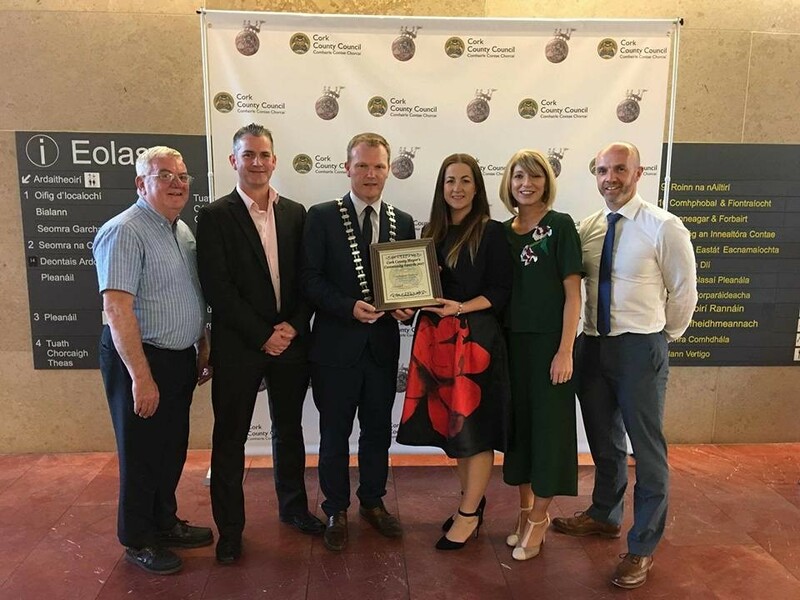 The first accolade was from the Lord Mayor of Corks Community & Voluntary Awards 2017 for which we thank his Excellency Cllr Des Cahill, for seeing fit to place us in the same category as some exceptional community groups and some truly amazing volunteers. The second honour came from Cobh Community College who gave the group their Community award which was very special as many of us are past pupils. 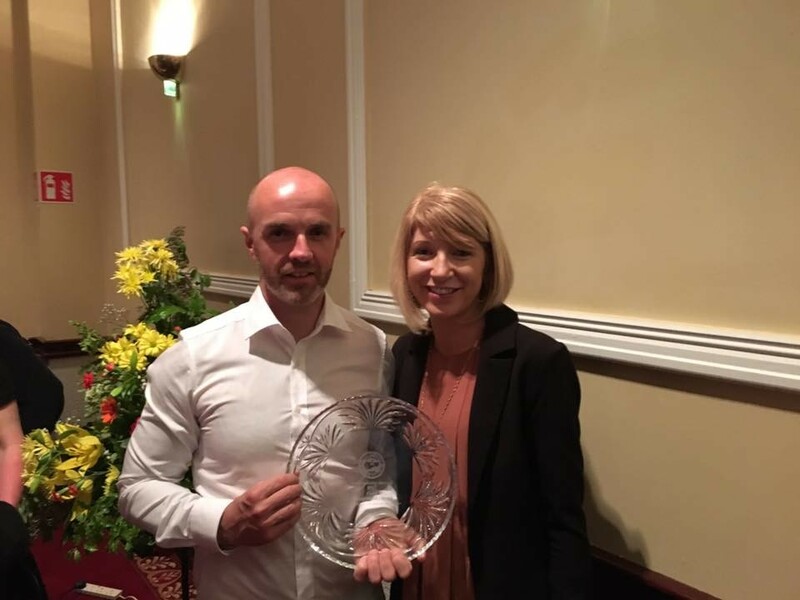 Mr Gerard Maher and Mrs Irene Dow accepting the Cobh Community College Community award. I would like to ask you to come to Cobh in the future, mark this wonderful town down in your calendar for a family day out. Why not pick a day that one of the gigantic liners will be alongside. Put the kids in the car or take the train to Cobh. If you drive to visit us, please park in the free ‘Five Foot Way’ car park down by the quay. You will see the liner casting its shadow over the red brick of the Cobh Heritage Centre, just down from you there will be a fleet of mobile homes & RVs parked next to the services area and the passenger ferry will be pulling away from the new marina taking visitors to Spike Island. No doubt while there are people waiting for the next one, there will be some industrious entrepreneur selling mugs of an artisan roast, the brilliant outdoor gym will be in use by all those lyric clad ones who make us all feel slightly jealous really, the new solar-powered green energy public amenity (with a baby changing table, we promise we got it into the plans!) will be accessible to those who have had to bring little people a long way! And there by the water edge will be the new playground, full of local and not so local children, watched over by mums & dads relaxing on the benches. The cry of the seagulls, the throb of the engines of the passing container ships, the shrill pipes echoing across from the Naval Base will be matched, if not drowned out entirely by the laughter & noise of happy, busy and active children doing what they do best. Being kids and having fun.